Many parts of the world are becoming increasingly secularized (which may have contributed to the recent terrorist attacks), and the United States has also been riding that same trail. The rights of Christians are coming under increasing attack by atheistic owlhoots, and secular humanism is steadily becoming established as the state religion. Know what God says about people who deny him? See Psalm 14:1. Secular humanism is a religion by their own admission, philosophically, and by court rulings. While many atheists such as Clinton Richard Dawkins are calling this a "major victory", some dishonest atheists are still trying to change reality and deny that humanism is a religion. They accept the religion of evolutionism as foundational (but deny that evolutionism is a religious): "Humans are an integral part of nature, the result of unguided evolutionary change. Humanists recognize nature as self-existing." Atheists like Michael Zimmerman have been trying to get churches to compromise on creation. 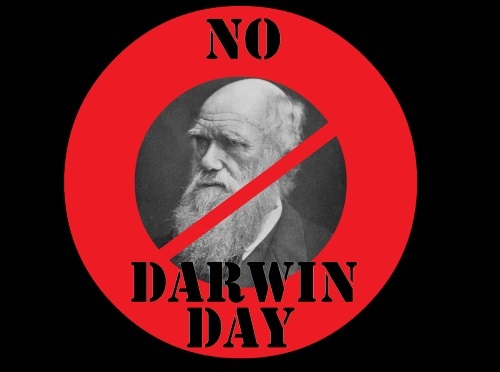 Now some federal tinhorns are attempting to establish "Darwin Day". Problem is, the First Amendment to the United States Constitution expressly forbids the government establishing a state religion: "Congress shall make no law respecting an establishment of religion, or prohibiting the free exercise thereof; or abridging the freedom of speech, or of the press; or the right of the people peaceably to assemble, and to petition the government for a redress of grievances". Of course, they have been establishing humanistic religion for a mighty long time now. This "all hail Darwin, blessed be!" stuff takes the rag off the bush. And this will continue as they seek to deny our Creator and enthrone man. There is resistance. We already have Question Evolution Day happening annually on February 12, which is by and for the people. There is also Creation Sunday, which I encourage churches to be a part of. But let's turn up the heat a bit more, shall we? Americans should speak out and let legislators know that Darwin Day is unacceptable, and violating the Constitution. To read the rest, click on "Stop Darwin Day!" Also, you can become involved at the new Stop Darwin Day Facebook Page.